In addition to robust electronics systems, the Khanid Kingdom's ships possess advanced armor alloys capable of withstanding a great deal of punishment. Generally eschewing the use of turrets, they tend to gear their vessels more towards close-range missile combat. 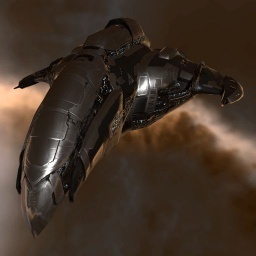 The Damnation is one of the Amarr command ships, designed as a tanky missile platform. The Damnation has bonuses to armor and information warfare bursts and like all command ships can fit 2 command burst modules out of the box. Even among command ships the Damnation is especially tanky, with a bonus to armor resistances AND armor hit points, allowing it to fit an enormous buffer tank. This makes it a popular pick for a fleet booster for large armor fleets. Further information about additional or recommended skills to pilot Damnation for a specific or it's common role(s) can be written here. No sub-article about Damnation roles or piloting tactics. You can write them here. You can write additional notes for Damnation here.